Top media personality, Tosyn Bucknor hosted friends, creative enthusiasts and fans at her lifestyle event, Brunch with Tosyn. 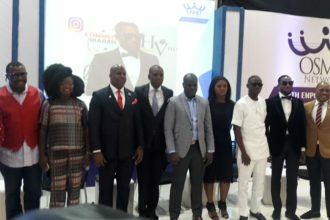 The highly interactive event which was initiated by Tosyn to connect fans with some of their most loved personalities while creating an opportunity to network and make impact, had Marketing Communications expert, Steve Babaeko as guest where he shared tips with guests on ‘How To Grow Your Personal Brand’. At the event, guests had the opportunity to network with one another and also exchange knowledge in a warm and fun-filled atmosphere. The highlight of the event was the speed-mingling session after which the most interactive guests were presented gifts by the amiable host. Speaking on the idea behind the monthly brunch event, Tosyn Bucknor said her love for being around people and watching people connect, as well as a love for food led to Brunch With Tosyn. Notable faces spotted at the event include singer Jodie Odiete and Ebony Life TV host, Lamide Akintobi who said, ‘the atmosphere was really warm and inspiring, I am excitedly looking forward to the fourth edition of Brunch With Tosyn”. This edition of Brunch with Tosyn was proudly supported by 360 Nobs, Bella Naija, Exquisite Magazine, OloriSupergal, Onobello and TBDC. The guests got goody bags with House of Tara and SPEECHgirl Tees products.